These easy make ahead cheese ball bites are the perfect elegant appetizer for any gathering! 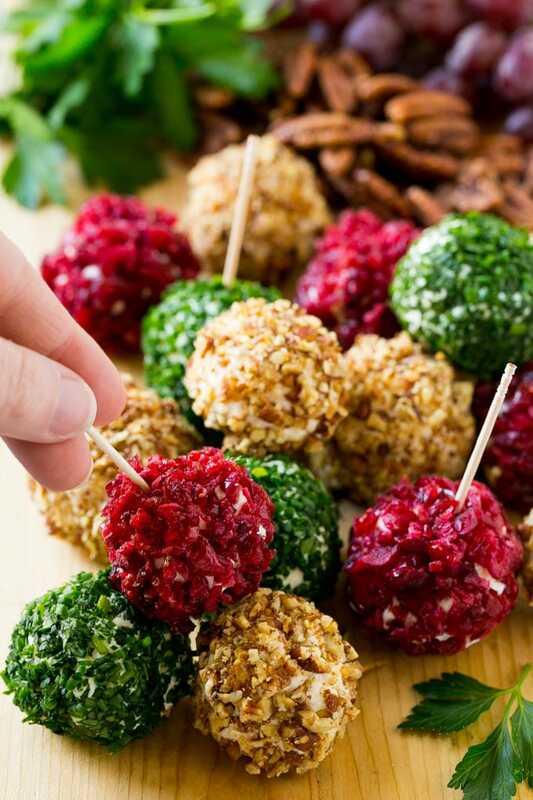 These ultra creamy cheese ball bites practically melt in your mouth, they’re such a fun and unique snack for a special event. 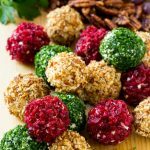 These cheese balls are as fun to look at as they are to eat, it’s a super colorful way to celebrate! I am a sucker for a good cheese ball, they’re on every appetizer table for a reason! These cute little cheese ball bites have the same great flavor as a regular sized cheese ball, but they’re more elegant looking and can be rolled in a variety of toppings. Once you’ve tried these mini cheese balls, you won’t want to go back to the full sized ones! These cheese ball bites are made with a combination of cream cheese, sharp white cheddar cheese and mascarpone cheese. Mascarpone cheese is an Italian cheese similar to cream cheese, except that it’s a little sweeter and a lot creamier. You can find mascarpone cheese in tubs in your deli section or sometimes near the cream cheese. The mascarpone cheese gives these cheese ball bites a melt in your mouth texture, it’s definitely worth using! If you can’t find mascarpone or don’t want to use it, you can substitute more cream cheese or a soft goat cheese. I like to use a high quality, extra sharp white cheddar and I grate it finely so that it’s easier to fully incorporate it into the soft cheeses. 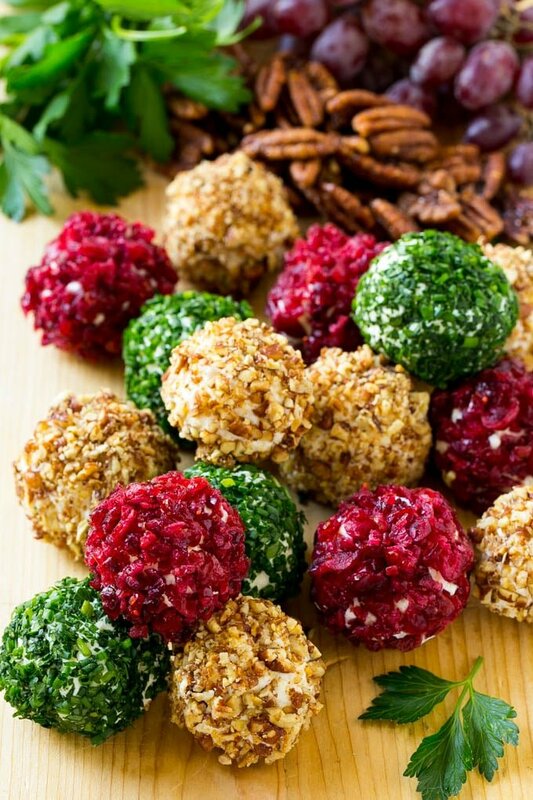 I like to roll my cheese ball bites in holiday colored ingredients to flavor them, they come out so pretty and festive! Here I’ve got chopped candied pecans, cranberries and herbs. Other great choices would be cooked crumbled bacon, walnuts, pistachios, dried apricots, pomegranate seeds, smoked paprika, almonds, there are so many different options. You just want to make sure that the toppings are finely chopped so that they easily adhere to the little cheese balls. Traditionally, cheese balls are served with crackers. You can serve these cheese ball bites on top of crackers, or simply serve them on a platter with some toothpicks so people can grab their favorite flavor. I like to serve my cheese balls almost as you would a cheese board with grapes, nuts, and other accompaniments that pair well with cheese. You could even serve toasted baguette slices on the side for a little different twist. These mini cheese balls can be made up to 8 hours before you plan to serve them. Simply follow the recipe, cover the cheese balls with plastic wrap, and remove them from the refrigerator about 10 minutes before you plan to serve them. They’ll be the first snack to go at your party, and everyone will ask for the recipe! Place the cream cheese and mascarpone cheese in a bowl; using a mixer or a large spoon, mix until thoroughly combined. Add the cheddar cheese and salt and pepper to taste, mix until well combined. Roll the mixture into bite sized cheese balls. Place the cranberries and pecans on two plates. Mix together the chives and parsley and put the herbs on a third plate. Roll 1/3 of the cheese balls in the pecans, 1/3 in the cranberries and 1/3 in the herbs. I love these! I used to make cheeseballs years ago – then stopped. I’m going to have to start again and try these! Wow these are so pretty and festive. I bet they taste good too! Nothing says Christmas like a cheese ball. I live for them!! I love these! They are even themed for Christmas. I can’t wait to try these out! Oh this is a really nice recipe! My husband is a cheese ball fanatic. I love cheese balls! These are perfect for holiday parties and gatherings! They look festive and they sound delicious. If there’s one thing I can’t go wrong with serving in my house, it’s cheese. These look super delicious and so festive! I’ll have to make these! These sound so amazing! I love mascarpone! I will definitely be making these for our holiday gathering! Cheese balls are one of my favourite things to serve at a dinner party. I love the idea of cheese ball bites for a dinner party. 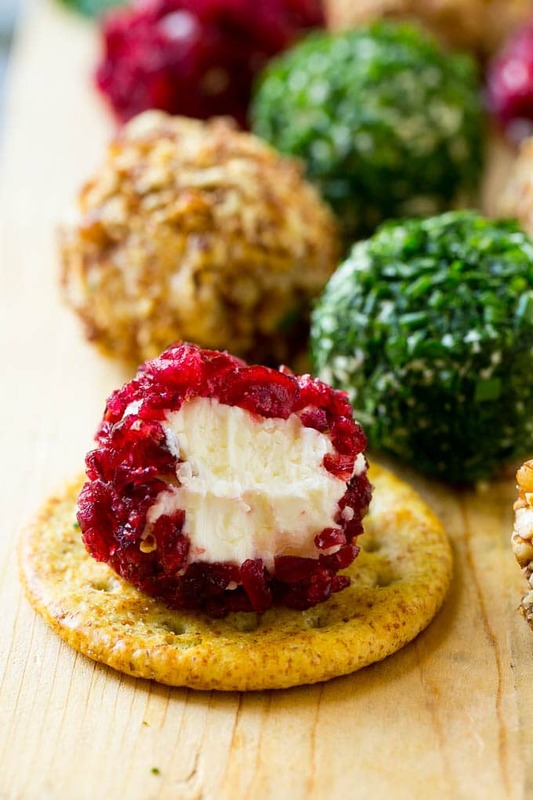 A fun and tasty way for the guests to sample the different cheese ball options. These cheese balls look so good. I love cheese balls around the holidays! Cheese ball appetizers are awesome and they’re always a hit with the people in the party. After all, who doesn’t like cheese, right? I think this is such a lovely idea! These cheese balls are so colorful! I’ve never seen cheese balls with that much color before! Oh, these are pretty clever. Offering a few varieties at a party would definitely be a good idea. So many toppings would be good with them. Those are fantastic! I love that you made them look like little ornaments! That’s so cute. Great idea. I am famous in my family for my cheeseball, but never thought to make them into bites. Love this.